A cataract is a very common eye illness and affects a large section of the population all over the world. It is a reversible cause of blindness, and laser cataract surgery can be used to fix vision very quickly. Here are seven facts about the disease which might surprise you. Cataract is the primary reason behind blindness across the globe. Over half of the people in the U.S. would have contracted cataract or may have already undergone a surgery to correct it by the time they hit their 80s. With the accumulation of protein clusters in the eye lens, a cataract patient may experience hazy vision, reduced night vision, increased glare and/or faded colors. One of the major reasons for contracting cataract is age. Diabetes, sun exposure, alcohol abuse, and smoking are some of the risk factors that can lead to cataracts. Cataract is often misunderstood as an illness that is associated with aging. Medical research suggests that there are babies who have congenital cataracts from birth. Further, it is also possible to develop this illness in childhood as a result of poor womb development or infection. Even younger adults are at a risk of developing cataracts due to various reasons. Most people believe that the development of a foggy layer or film on the surface of the eye lens is what is termed as cataracts. This is untrue. Cataracts will actually develop on the inside of your eye. Your vision becomes hazy because of the breaking down of the proteins that make up the typically crystal- clear lens. A cataract is not easy to feel and could take several months or even years to become a serious concern that requires surgery. Even though it is more common to have bilateral cataracts, the problem could come up in a single eye also. This is especially true for people who have experienced some type of trauma or blow to one of the eyes. The death of cells and their subsequent accumulation on the eye lens is what causes the development of cataracts. The cataract surgery is performed to remove the cloudy lens by making a tiny cut in the eye cornea. 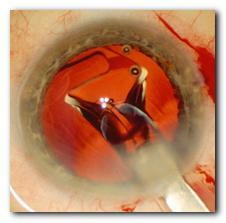 This is then replaced by a new, artificial lens, also termed as an intraocular lens. LASIK surgery can be performed after a cataracts operation with a gap of approximately 3 to 6 months, depending on your specific case. This will help eliminate the need for glasses for various purposes such as reading, driving, and so on.